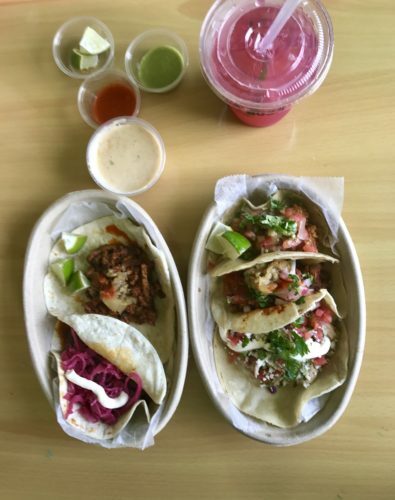 The speed of our news cycle is so breakneck, I’m embarrassed to admit that it took longer to write a post about our first bite impressions of Santa Rosa Taqueria than for Anthony Scaramucci to start and abruptly stop working at the White House. Enough of the zeitgeist-y talk: You are here to find out about tacos, and I’m here to regale you with my opinions and those of Claudia. When Micheline Mendelsohn, sister of Spike, announced that Béarnaise would close in May and would be replaced by a taqueria, I was sad. Béarnaise was a solid steak-and-frites restaurant that later expanded its menu to give more of a French bistro experience, as well as to cater to different parts of the Hill. Although it fit nicely in the neighborhood and the food was quite good, it seems that the Mendelsohn siblings opted for sticking to the formula that has worked so well for them with Good Stuff Eatery and We, The Pizza: Provide beloved, flavorful and unfussy food to the office workers and the tourists, and the Capitol Hill masses will follow suit. And so it is with Santa Rosa: Another easy staple winner where David Brooks’s friend would be able to order with little self-consciousness, I suppose. Gone are the tablecloths and gone is most of the waitstaff. Instead, there is a quick-order counter in the western part of the two-rowhouse space where you can (quickly) decide which tacos you want, in which kind of tortilla, just how unburdened by vegetables you want them, and whether you want any additional snacks, such as queso and chips. Speaking of the queso, Claudia felt Santa Rosa’s was excellent. Also of note are the Sloppy José nachos –featuring the touted queso– look like the kind of fatty snack we might all need sometime in the beginning of December, when the nights are exceedingly short and there are no Mexican national days to give a veneer of civility to our Tequila bingeing. The tacos are solid. During our visit it was impossible to discern whether the corn tortillas are made in-house, though I suspect they are shipped from a quality provider. They were able to withstand most of my abuse without breaking down and didn’t need to be doubled-up. The flour tortillas were well-shaped and soft, though not overly lard-y. A word of caution: the Al Pastor tacos are served with a pineapple relish that is hotter than you may be prepared to tackle (and which should have a warning or two). Since the meat and the relish are not incorporated, you should be able to order the pork meat on its own. At Santa Rosa, you can order your tacos with “Mexican toppings,” meaning that you can order them topped with cilantro, onion and radish, or hold the greenery. The absolute winner during our first visit was one of the aguas frescas at the counter. The one we tried was pineapple and hibiscus flavored, and it was just sweet enough and very refreshing. I look forward to trying the mole sauces and the salads on future visits, though I will make sure to ask about the heat level before ordering. WHY: Because the Mendelsohns have mastered the art of cheap eats and you gotta have some lunch. Make sure you beat the lunch rush by arriving between 11 and 11:45 so you can ask all the questions you’re dying to ask.